Khom, 14, and Phong, 12, leave their village just after the sun has risen. For 40 minutes they walk through jungle and rubber plantations, cross a small river using a tree trunk that has fallen across it and once on the other side sit on a motorbike for another 20 minutes just to get to school. Once there, they both join the same class, surrounded by Thai children aged 7 years old. This is the first year they have ever been to school. But Phong and Khom aren’t Thai, they come from a tiny ethnic group called the Maniq. Evidence suggests that long before the creation of the Kingdom of Thailand, as long ago as 25,000 years, negrito tribes of hunters and gatherers lived throughout the dense jungle of the Malay Peninsula in what is today Malaysia and Thailand. 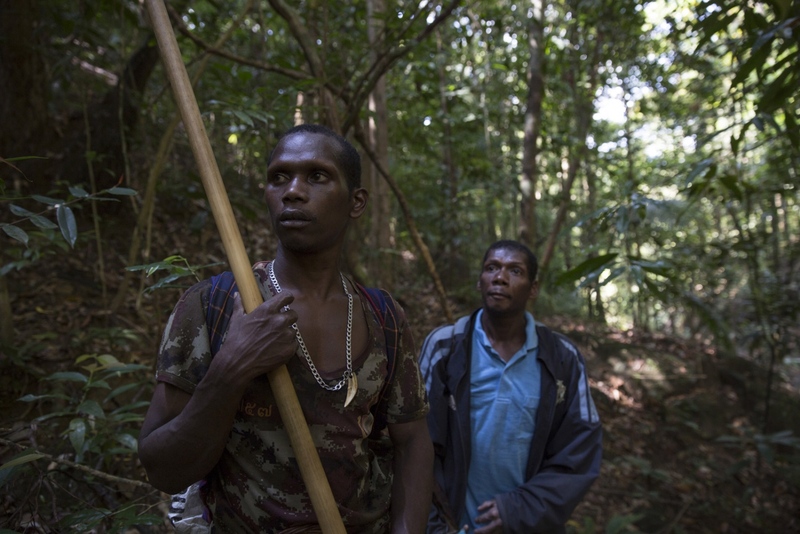 The Maniq, numbering no more than 350 people, are all that remains of this indigenous tribe who still navigates the dense jungle of the Banthat mountain range. 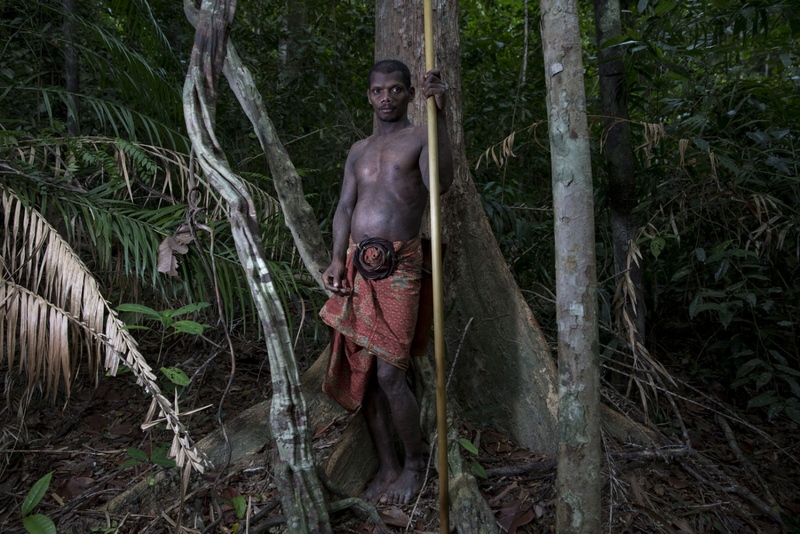 But still to this day they still hunt for animals in the forest using a blowpipe and poison arrows and sleep under shelters made of sticks and leaves. They speak their own unique language and have extensive knowledge of the medicinal benefits of the plants around them. Divided in to around 15 extended family groups some have settled, like the family of Phong and Khom, but most continue to live a semi-nomadic lifestyle following food and water sources in the forest, moving on when they run dry. Modern history hasn’t been kind to the Maniq. 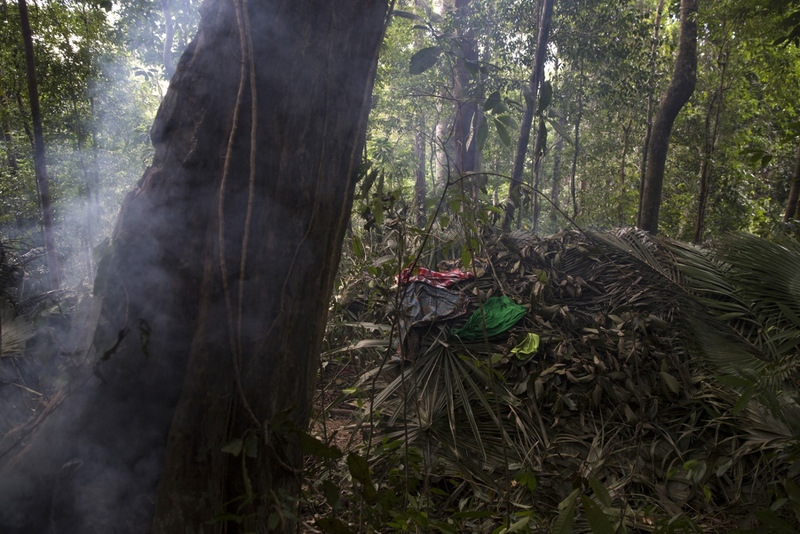 Living in the deep jungle and often on the move they remained relatively untouched until the 1960’s when they were forced to share the forest with Thai Communists who build remote camps to evade capture. During a decade of intense offensives by the Thai army the Maniq were often caught in the crossfire until the Communists eventually surrendered. But with the surrender of the insurgents and returning peace, a new battle began for the ownership of the land surrounding the forested mountains. 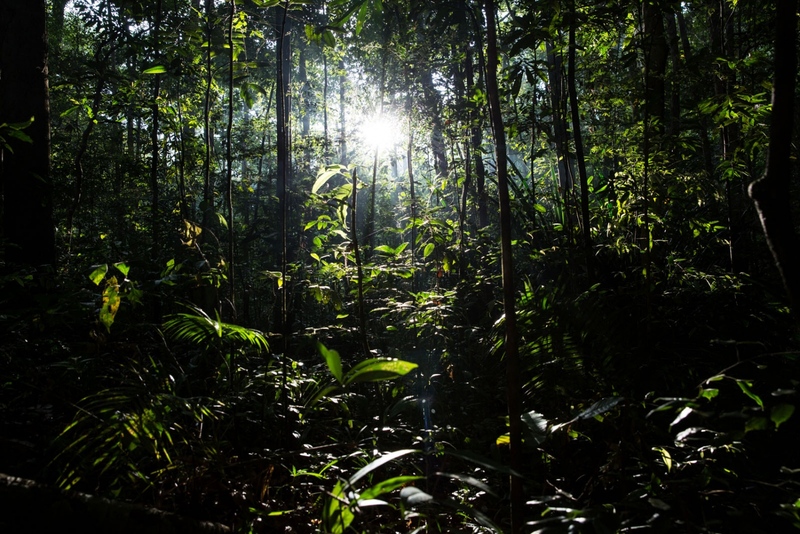 Local Thai’s moved in, formed communities and began encroaching on this intact eco-system, logging trees, forming plantations and poaching wild animals. Caught up in this scramble were the Maniq, who were now forced to compete with hunters with guns for food, watched helplessly as their forest shrank. Quiet, reclusive and misunderstood they are often incorrectly called Sakai (Malay word meaning ‘slave’) or Ngo-Ba (meaning ‘rambutan of the forest’) by Thai’s, term’s they dislike. Outside of the Southern Thai provinces they remain relatively unknown, even to most Thai’s. But if Thai’s have heard of them, it is often because of a famous story that tells how King Rama V adopted a young Maniq boy called Kanang. Kanang was taken to live in the Royal Palace in Bangkok and whilst he died young, only in his twenties, the Thai King’s affection for the boy was well known. Today the Maniq sit at a crossroads. 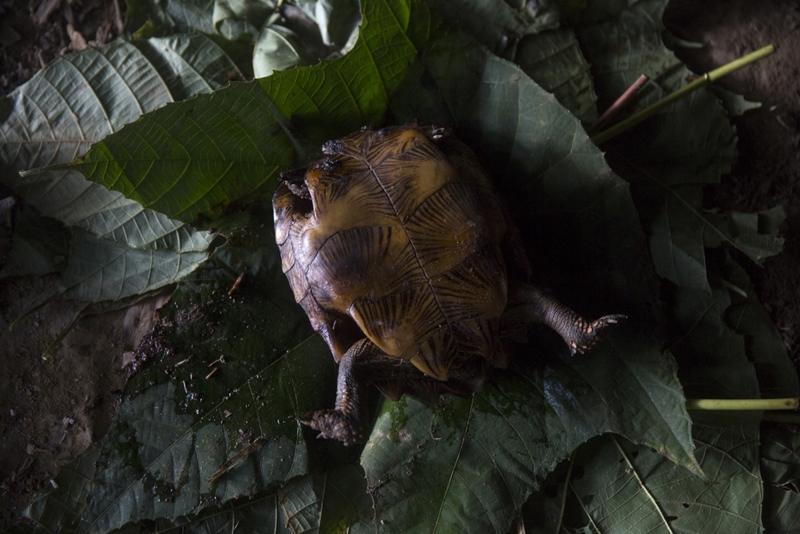 With wildlife having been severely over-hunted they are now unable to sustain themselves from the forest alone and more frequently move towards the peripheries of the forest, closer to Thai villagers, to supplement their diminishing food resources. Many see this increased accessibility to the tribe as having a negative impact on their unique way of life, indeed several groups of Maniq have decided to settle permanently and now work odd-jobs such as on rubber plantations or as labourers. Stories are rife about how they have been taken advantage of. The worst being when a town official in Satun Province forced a group of them sit under an imitation shelter made of sticks in a shopping centre so people could take their pictures. Something the official was later forced to apologise for. With all but the remotest dwelling of groups now being forced to the edges of the forest it seems that the Maniq’s ability to withdraw completely from Thai society as they have done for millennia is becoming harder to do. The dense jungle of the Banthat Mountains in Satun Province, Thailand. During the rainy season the Maniq search out caves, deep in the forest, where they will stay until the rains stop. Maniq children play in the trees at one of their temporary settlements. They will stay here for 2-3 months until the food sources in the vicinity are exhausted before moving on. A Maniq shelter, almost totally camouflaged in the forest. 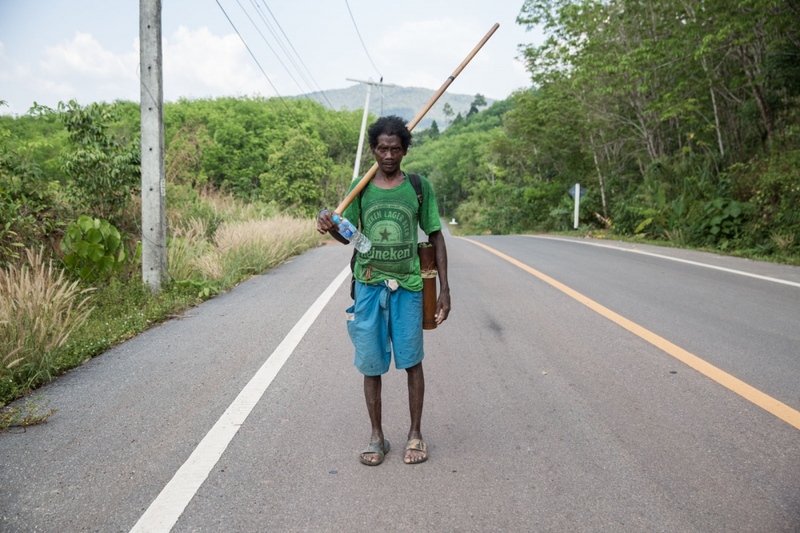 A Maniq man called Yaaw stands for a portrait holding the traditional blow pipe which they still use to kill animals of the forest. A group of Maniq youngsters walk bare-footed along a road to buy food from a shop in a nearby village. An elder called Ja stands for a portrait in his cave after having just returned from a days hunting in the jungle. 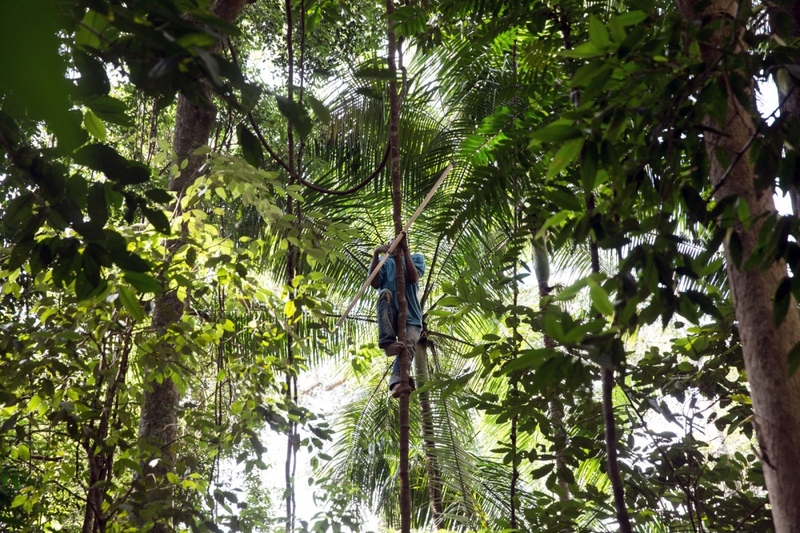 A Maniq man called Chae climbs up a thick vine to reach the canopy over 100ft up. 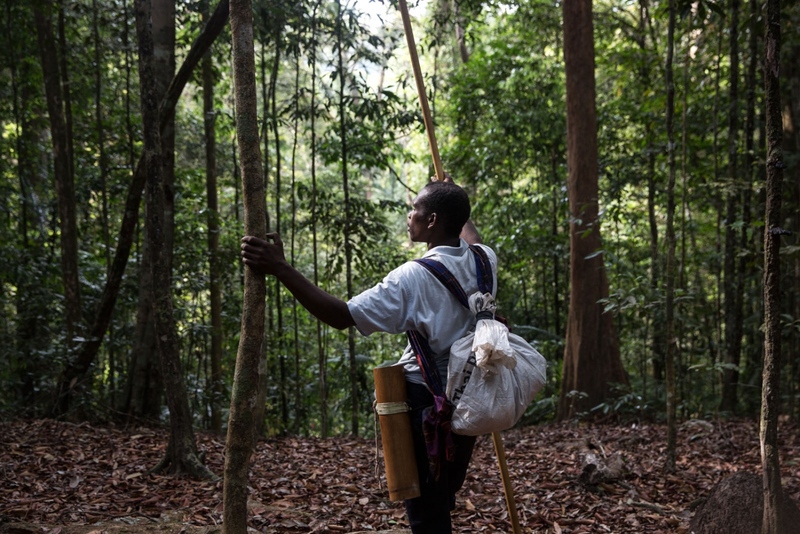 He carries with him his blow pipe which he will use to attempt to kill a macaque that him and his friend have been stalking for hours. A recently killed macaque is shared amongst the families in this particular group. A mother and child stand in a cave. During the rainy season groups search out caves deep in the forest where they will stay until the rains stop. Out of the 15 or so groups of Maniq only those living in Trang province have given up nomadic life and settled forming small villages. This is the first group of Maniq children ever to attend school. 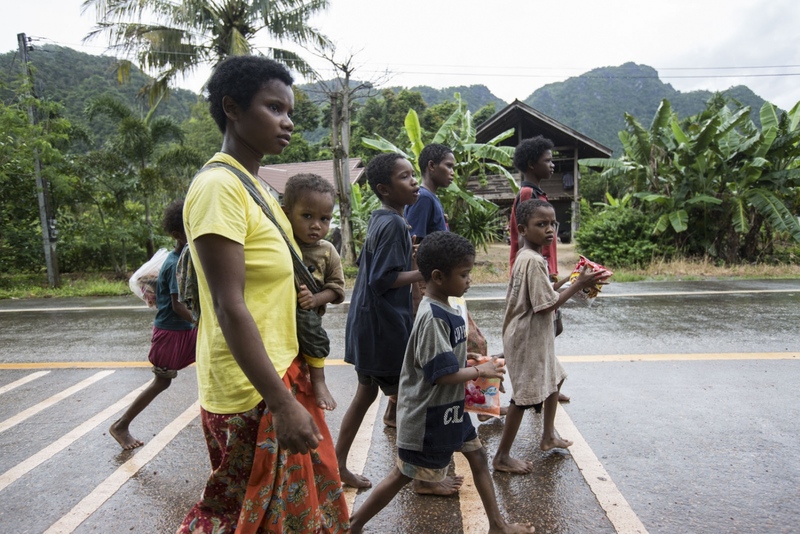 A Maniq group of approximately 20 people living in a remote area of Satun Province. A Maniq man called Sin sits illuminated by a head torch in the forest. Sin's father was killed by a tiger many years ago whilst he was on a hunting trip. Since then there have been no tiger sightings. Two teenage Maniq boys practice making their blow pipes made of bamboo in their rock shelter. A group of Maniq sit around in a small Maniq owned village shop. Having given up nomadic life this group formed a permanent community. 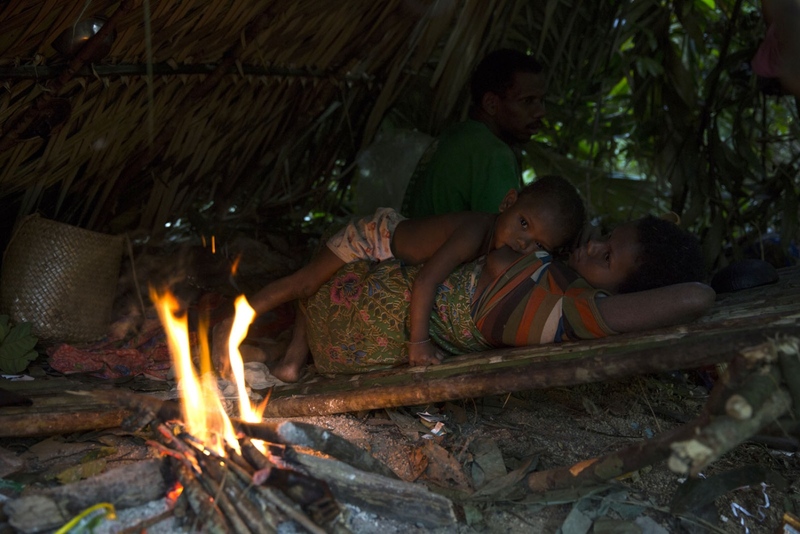 A Maniq family collects wood from the forest to fuel their camp fires. The Maniq rarely fell trees, but collect old and fallen branches. A young girl takes her little sister outside of their shelter made from leaves and sticks from the forest. A 12 years old Maniq boy called Phong attends class for the first time in his life. Because they have previously never attended school they must sit in a class aged for 7 year olds. A child feeds from his mother inside their traditional shelter. A monkey caught in the forest is brought back to camp and will be divided between everyone in the clan. With around 20 people tonight there won't be enough food. Husband and wife Ja and Jin sit in their rock shelter where they will remain in until the rains stop. A Maniq man called Ayben checks his blow pipe prior to a hunting trip. 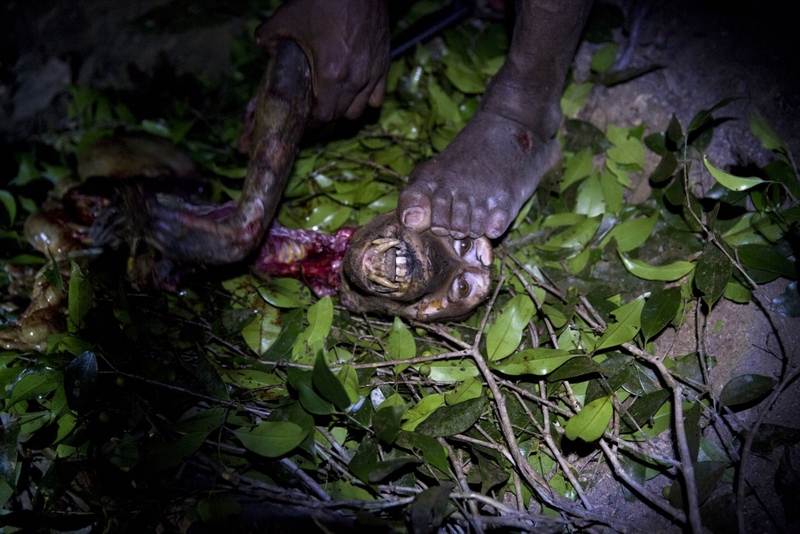 Often the Maniq men will walk for days, sleeping in the forest, until they kill something. 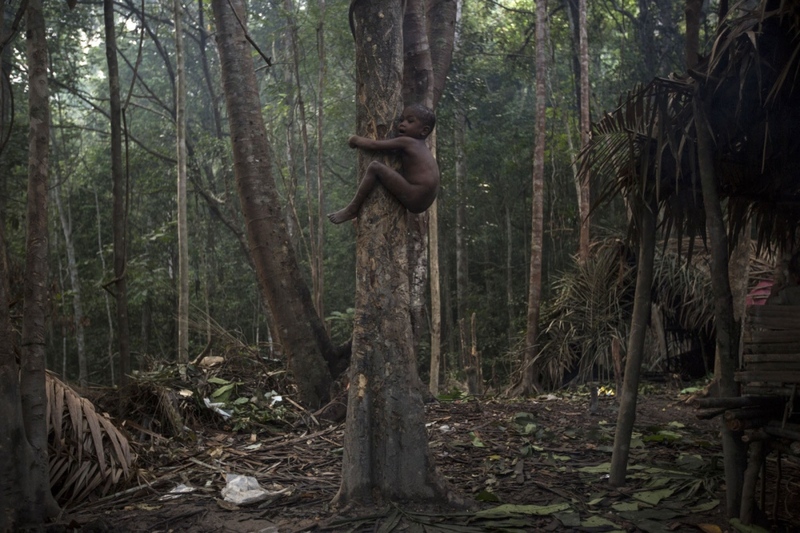 Food remains a permanent problem as the resources of the forest are now not enough to maintain their small population. Two Maniq teenage boys cut bamboo poles to practice making their own blowpipe. 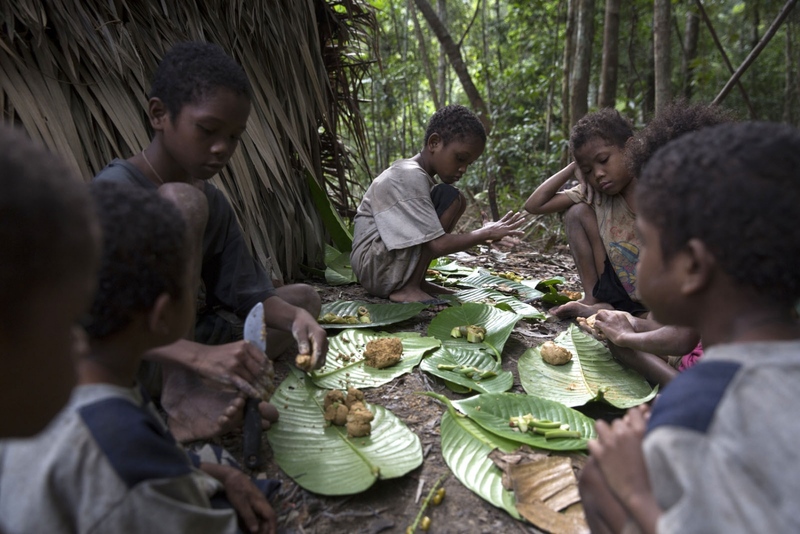 Maniq children play a game using leaves and balls of mud in their temporary settlement. 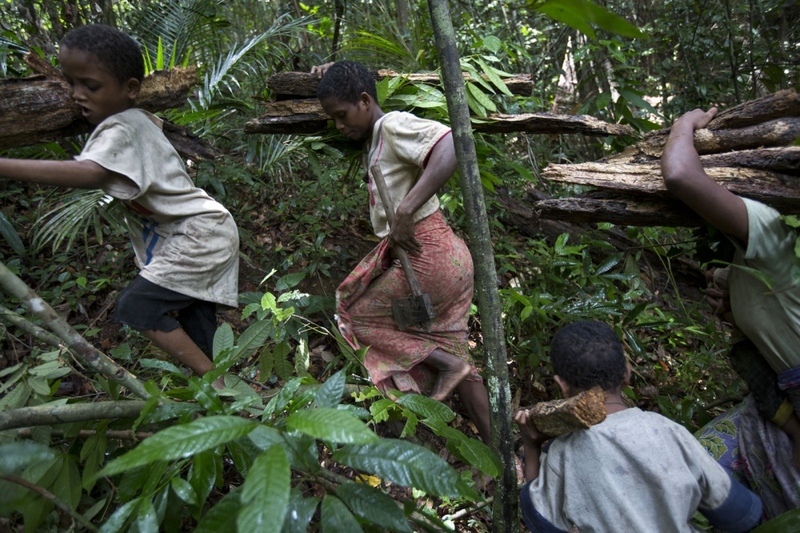 Very few Maniq children go to school so their spend their days playing in the forest. A Maniq man sits in his shelter at dusk. Many keep a fire burning inside their shelter 24 hours a day to indicate that it is occupied. 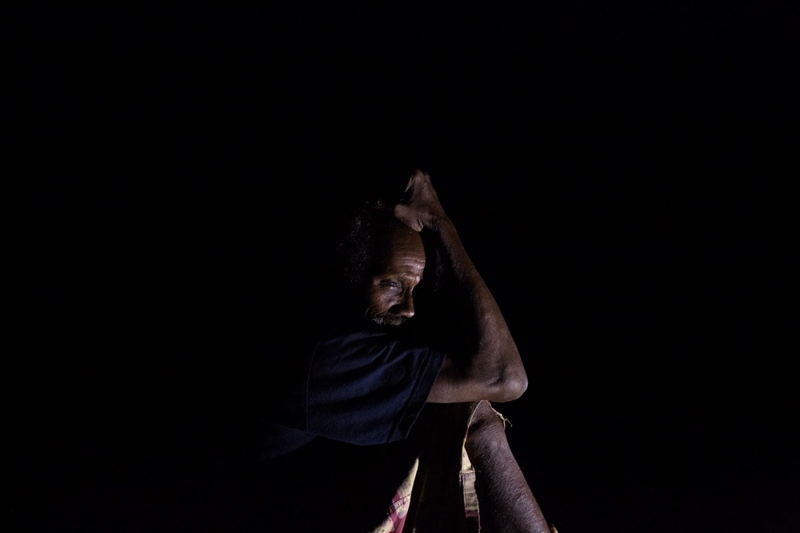 A Maniq man carves new darts which he will use to hunt for animals of the forest. A recent hunting trip by a male member of the group produced just one turtle to be shared amongst the four families. 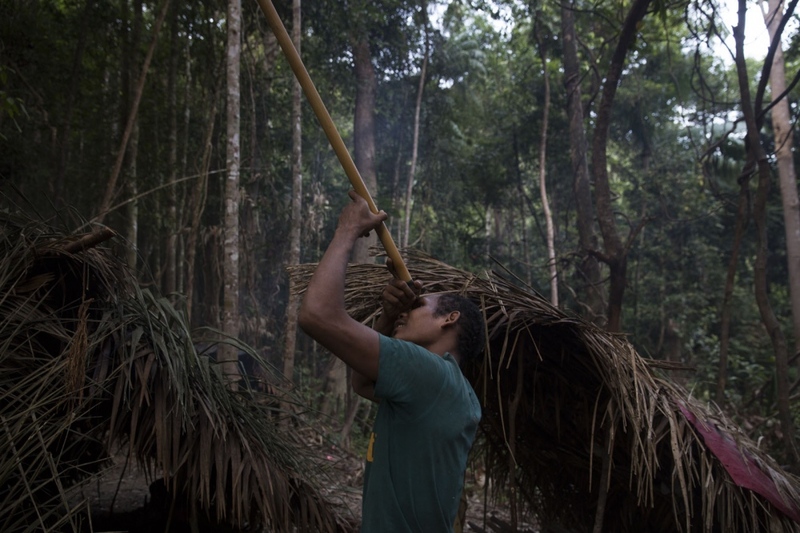 A Maniq man called Boy prepares his blowpipe prior to a hunt. Ya sits with a group of children on the steps of his stilted home. Out of the 15 or so groups of Maniq only those living in Trang province have given up nomadic life and settled down forming small villages. 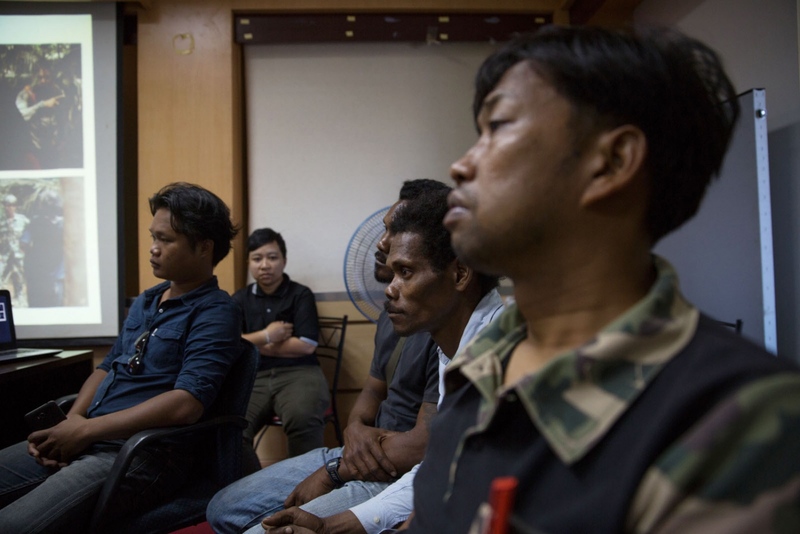 A Maniq man called Yaaw attends a meeting inside the Trang city Municipal Hall. The meeting was organised during the research trip by The National Human RIghts Commission of Thailand who were discussing the process of the Maniq obtaining citizenship. After applying the poison to the darts (which comes from a certain species of tree) Ayben leaves it to harden on a smouldering fire before a hunt. Tik and Chae on a 3 day hunting trip deep in the forest. 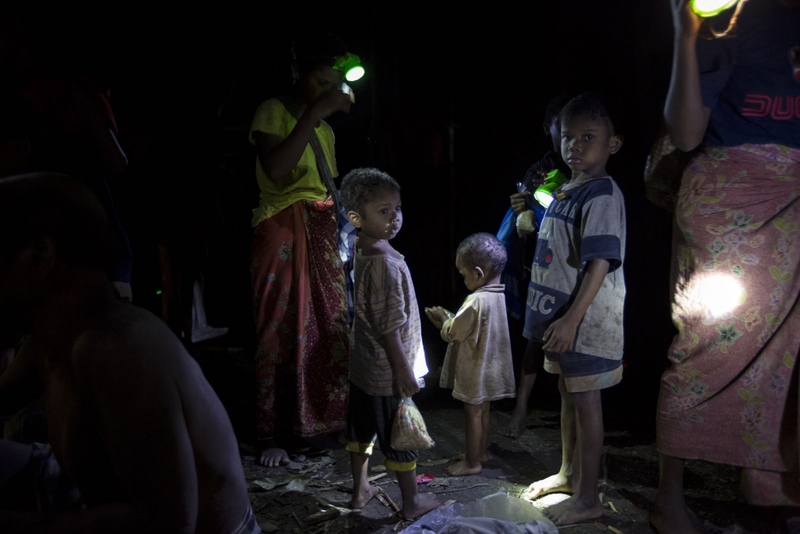 A group of Maniq children and their mothers use head-torches in their camp at night. 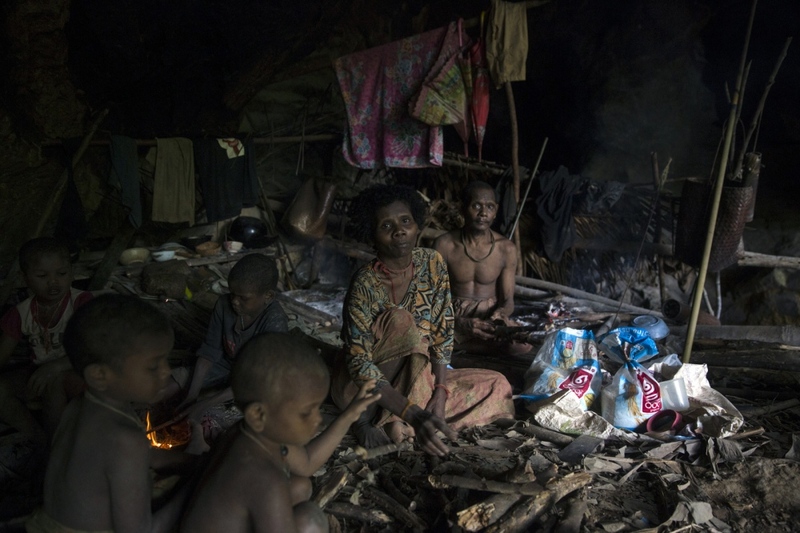 A family group sit in their shelter whilst Ja (left) moulds a natural resin to fix his blowpipe. Tik stands at the top of a forested hill scanning the forest for signs of animal life. During this particular three day hunting trip they caught no animals. Even from an early age the Maniq are incredible tree climbers. This child, no older than 3 years, can climb trees unassisted. 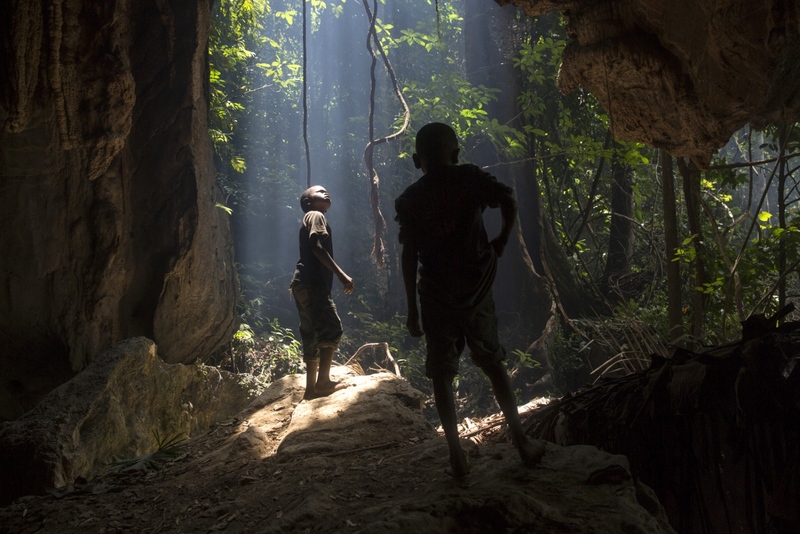 Two Maniq children stand in the mouth of a cave that they are living in during the rainy season. Jin sits looking out of the cave. Yaaw walks back home to his clan's semi-permeant settlement after a day of rubber tapping. Too old to hunt and with not enough food he is forced to take up daily labour jobs for cash. But he stills takes his blowpipe and poison darts with him.